The title of this post should probably be Baked Corn Bread Muffin Thingies That Probably Shouldn’t Be Called Fritters But I Don’t Know What Else To Call Them Thingamajiggers. Yeah, seriously I have no idea what to call them. They’re good, that’s all that matters. I made these to serve with my vegetarian quinoa chili. The original recipe had them cooked in a skillet, but I decided to do these in the oven instead. I think I’ll try them in a skillet a different day, when I’m in the mood for some crispy fritters. Because these corn thingies (most appropriate name I can think of) are more muffiny than crispy frittery – just an FYI. I can’t wait to make these again! Preheat oven to 400F. In a bowl, mix together flour, salt, baking powder, cumin, sugar, cayenne pepper. In a separate bowl, mix together egg, milk, and butter. Stir the wet ingredients into the dry ingredients. Then stir in the corn and green onions. Spray 10 out of 12 cups of a muffin pan with cooking spray. Spoon mixture into the muffing cups. Bake for 18-20 minutes, or until golden brown. 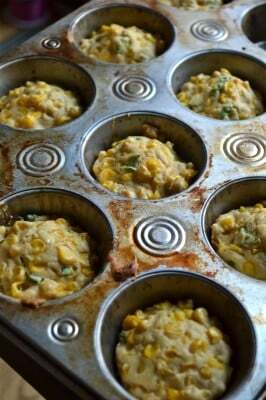 These Baked Corn Fritters are easy and taste great. They are a perfect side for the Chicken Quinoa Chili. And since they are full of so much corn they have a really sweet taste. Great warm with a spread of butter. Does the frozen corn need to be thawed?